Leah Hogsten | The Salt Lake Tribune Kalyani Gopalan sits in the temple after praying Thursday, March 28, 2019. Artisans from around the world spent two years hand-carving deities in the Sri Ganesha Hindu Temple in South Jordan. Leah Hogsten | The Salt Lake Tribune Sri Ganesha Hindu Temple priest Sathish Nivarthi makes offerings to the planets of the Navagraha shrine, March 28, 2019. Hindu priests act as a kind of mediator between the worshipper and the deity, performing rituals to the deities on behalf of the worshippers. Artisans from around the world spent two years hand-carving deities in the Sri Ganesha Hindu Temple in South Jordan. Leah Hogsten | The Salt Lake Tribune Lakshmi is the goddess of wealth and proserity, both material and spiritual. Lakshmi symbolizes good luck. Artisans from around the world spent two years hand-carving deities in the Sri Ganesha Hindu Temple in South Jordan. Leah Hogsten | The Salt Lake Tribune Deepika Singareddy recites the Vishnu and Lalitha Sahasranamam every day for an hour at the temple. Artisans from around the world spent two years hand-carving deities in the Sri Ganesha Hindu Temple in South Jordan. Leah Hogsten | The Salt Lake Tribune Shiva and his bride Parvati. Artisans from around the world spent two years hand-carving deities in the Sri Ganesha Hindu Temple in South Jordan. Leah Hogsten | The Salt Lake Tribune Radha and Krishna are the beloved divine couple worshipped with affection in many Hindu traditions. Artisans from around the world spent two years hand-carving deities in the Sri Ganesha Hindu Temple in South Jordan. Leah Hogsten | The Salt Lake Tribune Sri Krishna is worshipped as a major deity in Hinduism. He is the god of compassion, love and tenderness. Krishna is depicted (above) as a child, who after hearing that the snake Kaliya had poisoned the waters of the people of Gokul, jumped on the hood of the snake and pulled its tail. Recognizing Krishna's divinity, the serpent Kaliya bowed to the Lord asking forgiveness. Artisans from around the world spent two years hand-carving deities in the Sri Ganesha Hindu Temple in South Jordan. 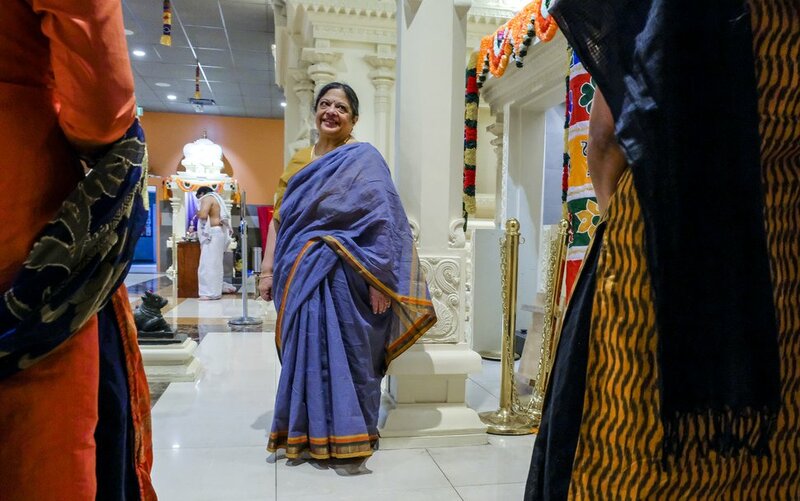 Leah Hogsten | The Salt Lake Tribune Indra Neelameggham talks with fellow devotees of the Sri Ganesha Hindu Temple, March 28, 2019. Artisans from around the world spent two years hand-carving deities in the Sri Ganesha Hindu Temple in South Jordan. Leah Hogsten | The Salt Lake Tribune Nataraja or Nataraj, the dancing form of Lord Shiva, is a symbolic synthesis of the most important aspects of Hinduism, and the summary of the central tenets of this Vedic religion. Snakes that stand for egotism, are seen uncoiling from his arms, legs, and hair, which is braided and bejeweled. His matted locks are whirling as he dances within an arch of flames representing the endless cycle of birth and death. On his head is a skull, which symbolizes his conquest over death. Goddess Ganga, the epitome of the holy river Ganges, also sits on his hairdo. His third eye is symbolic of enlightenment. The whole idol rests on a lotus pedestal, the symbol of the creative forces of the universe. Artisans from around the world spent two years hand-carving deities in the Sri Ganesha Hindu Temple in South Jordan. Leah Hogsten | The Salt Lake Tribune Sri Ganesha Hindu Temple of Utah is named for the main deity Ñ Lord Ganesha Ñ depicted as a six-armed elephant, Lord Ganesha is regarded as a god of wisdom and knowledge. Hindus also believe he helps to remove all obstacles from one's path. Artisans from around the world spent two years hand-carving deities in the Sri Ganesha Hindu Temple in South Jordan. Leah Hogsten | The Salt Lake Tribune Indra and Dr. Neale Neelameggham are pillars of the Utah Hindu community. The couple established a temple in their basement and invited their faith community to worship in their home and when the time finally came to build the Sri Ganesha Hindu Temple, the two were instrumental in fundraising and public outreach. 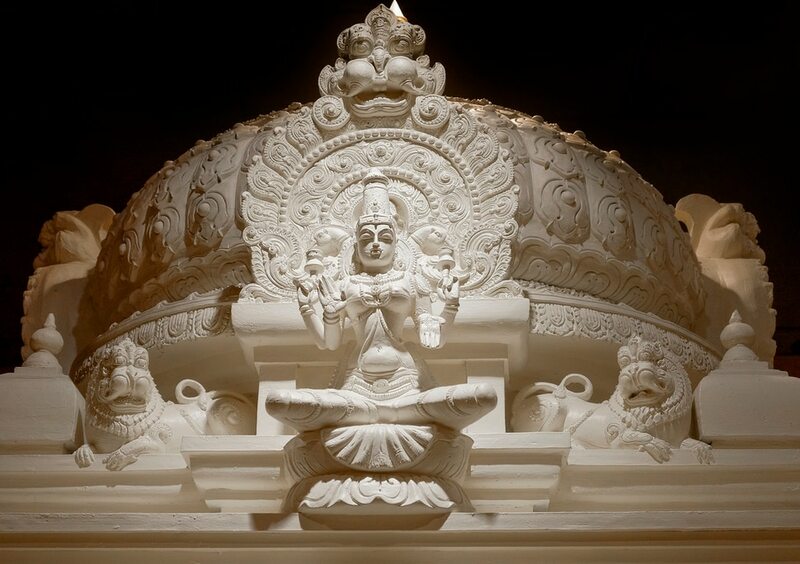 Artisans from around the world spent two years hand-carving deities in the Sri Ganesha Hindu Temple in South Jordan. 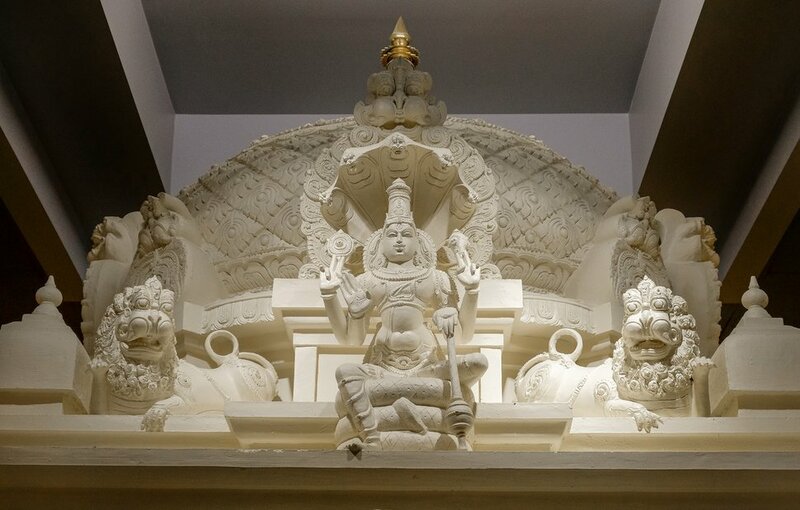 Leah Hogsten | The Salt Lake Tribune Maha Vishnu, the eternal protector. Artisans from around the world spent two years hand-carving deities in the Sri Ganesha Hindu Temple in South Jordan. Leah Hogsten | The Salt Lake Tribune Sri Ganesha Hindu Temple priest Sathish Nivarthi makes offerings to deities Shiva and Durga, March 28, 2019. Hindu priests act as a kind of mediator between the worshipper and the deity, performing rituals to the deities on behalf of the worshippers. Artisans from around the world spent two years hand-carving deities in the Sri Ganesha Hindu Temple in South Jordan. Leah Hogsten | The Salt Lake Tribune Sri Rama is one of the most adored God in Hindus and is one of the incarnations of Lord Vishnu. Sri Rama, center, his wife Sita Devi on the right, his brother Lakshmana on the left. Artisans from around the world spent two years hand-carving deities in the Sri Ganesha Hindu Temple in South Jordan. Leah Hogsten | The Salt Lake Tribune Niladevi Andal is depicted with stylized hair and is decorated with strings of pearls. She carries a parrot, a symbol of the discerning mind and a lotus in her hand. Artisans from around the world spent two years hand-carving deities in the Sri Ganesha Hindu Temple in South Jordan. Leah Hogsten | The Salt Lake Tribune l-r Deepika Singareddy and Nagamani recite the Vishnu and Lalitha Sahasranamam every day for an hour at the temple. Artisans from around the world spent two years hand-carving deities in the Sri Ganesha Hindu Temple in South Jordan. South Jordan • In a land of fast food restaurants, strip malls and car washes, the new tower of the Sri Ganesha Hindu Temple suggests a world apart. The gleaming tiers of the 34-foot spire, bedecked with sculpted figures and gold cones, hint at what will greet visitors inside the nondescript gray, cinder block building — a kind of heavenly city. Painted deities dressed in embroidered robes and silk tunics line three sides of the sanctuary, sitting under handcarved sculptures that tell the stories of the gods’ incarnations. For Utah Hindus, it finally feels like home — even for those who have never lived in South Asia but have nostalgia for the sights and smells of their ancestral abode. Devotees have enjoyed the temple since it was first consecrated in 2003 as a relatively small gathering space with the signature Ganesha statue, but the multifaceted individual shrines, iconography and tower did not fully take shape until after 2015, when it was rededicated. With the help of seven specially trained artisans, an Indian ambience emerged before their eyes. Gliding quietly on the heated marble tiles or meditating in front of one of the shrines, worshippers in the growing community find a sense of joy. Many visit daily; others come weekly or on major holidays. They come for blessings before a test, before a big game, before a new project or performance, before a birth or marriage. Who besides the Chinese and Irish built the transcontinental railroad? Latter-day Saints — lots of them. Background checks? Culture shift? Some therapists, members argue Latter-day Saints need to do more to vet their leaders. “You get energy when you come here,” says Manju Sundar as she circles a stand-alone shrine near the door nine times while meditating on the nine planets. 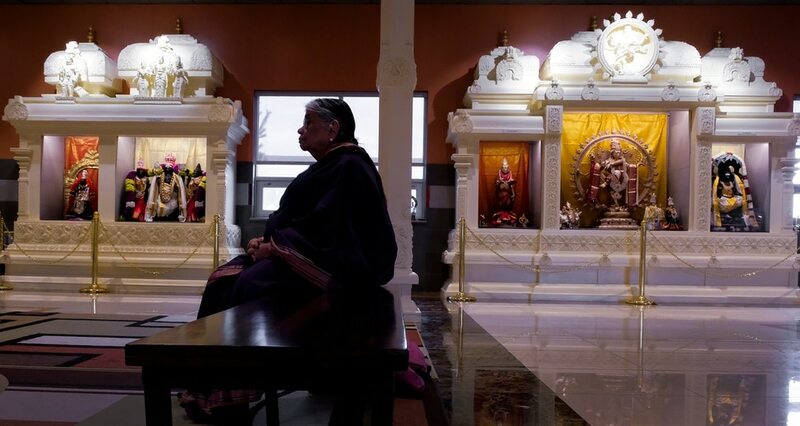 Leah Hogsten | The Salt Lake Tribune Indra Neelameggham talks with fellow devotees of the Sri Ganesha Hindu Temple, March 28, 2019. Artisans from around the world spent two years hand-carving deities in the Sri Ganesha Hindu Temple in South Jordan. The temple’s central deity is Ganesha, the elephant-faced god known as the “remover of obstacles,” explains Indra Neelameggham, a longtime leader who housed the donated statue in her basement from 1995 to 2003. In the original temple space, Ganesha’s shrine was in the center, where worshippers could sit on any side and chant or meditate. Starting in 2014, the sanctuary more than doubled in size, from a capacity of 240 to 650 attendees at a celebration. The expanded space was rededicated in 2015 — Hindu temples are rededicated every 12 years — as an act of “purification,” says Subramanyan. But only the four deities had individual shrines, he says, and the other 10 that were planned needed their own space. In addition, the Utahns wanted to add carvings common to Hindu temples that would express each deity’s purpose. So they arranged for seven Indian artists to come to the Beehive State for about two years to complete the painstaking work. Each sculptor has his own style (almost all are men), he says, whose knowledge has been passed down from generation to generation, from grandfathers to fathers to sons. 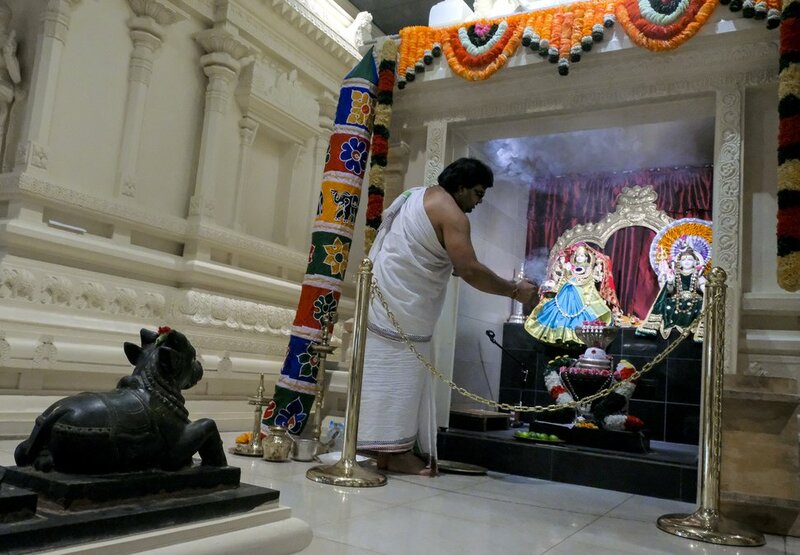 Leah Hogsten | The Salt Lake Tribune Sri Ganesha Hindu Temple priest Sathish Nivarthi makes offerings to deities Vishnu and Lalitha, March 28, 2019. Hindu priests act as a kind of mediator between the worshipper and the deity, performing rituals to the deities on behalf of the worshippers. Artisans from around the world spent two years hand-carving deities in the Sri Ganesha Hindu Temple in South Jordan. Now there are 14 separate shrines with a single figure or more, each in an alcove, along with the concrete carvings on top that add layers of awareness to the shrine. One god might be connected to a bull or a peacock. Another might offer hand gestures to suggest peace and prosperity. There is deity for learning, knowledge and the arts. One male god is depicted with two wives, symbolizing the unity of north and south Indian traditions. “It is meant to symbolize that all religion is one,” Neelameggham says. Besides counseling couples on auspicious occasions for a baby blessing, wedding or funeral, a priest chants daily before each of the shrines, sprinkling it with water, and placing fruit, rice and flowers in front of it. He also changes the deities’ adornments — sometimes as often as once a week. The temple has a storage closet to house devotees’ donations of silk, jewelry and other ornamentation for the gods. The female statues from northern India typically feature veils, Neelameggham says, because Hindus in that part of the country were influenced by Muslims, who long have required women to cover their hair. In both regions, male deities mostly wear white, she says, as do the priests. 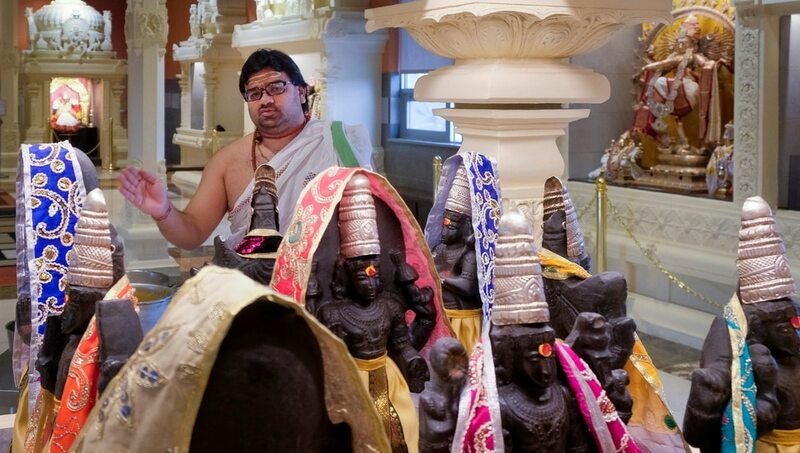 Leah Hogsten | The Salt Lake Tribune Sri Ganesha Hindu Temple priest Sathish Nivarthi makes offerings to the planets of the Navagraha shrine, March 28, 2019. Hindu priests act as a kind of mediator between the worshipper and the deity, performing rituals to the deities on behalf of the worshippers. Artisans from around the world spent two years hand-carving deities in the Sri Ganesha Hindu Temple in South Jordan. Most Indian temples have stand-alone spires, says Subramanyan, which signal their location and prominence. Kings used to build outside columns of varying heights, depending on the community’s wealth, he says. One in southern India reaches up 200 feet from the ground. The South Jordan tower is just under 35 feet, with nine cones forming a row on the top, which the priest doused with water for purification during the 2015 consecration ceremony. Towers also have served a more practical purpose — a place of refuge after a disaster or an invasion by a foreign army. They were built on high ground as a bulwark where people can go after a flood, which was a common experience in India. Leah Hogsten | The Salt Lake Tribune Maha Vishnu, the eternal protector. Artisans from around the world spent two years hand-carving deities in the Sri Ganesha Hindu Temple in South Jordan. Attached to the temple is the Indian Cultural Center, which now has added five classrooms. Last month, between 1,200 and 1,500 came to the temple for the Shiva holiday. As Utah’s Hindu population has surged to more than 8,000, these believers have felt valued and appreciated in the Mormon-dominated state. For his part, Nachaegari has never felt Hindus are “treated as outsiders,” he says. “There has been lots of welcoming."